As used in Chapters 1531 and 1533 of the Ohio Revised Code and the Ohio Administrative Code. ACCOMPANY means to go along with another person while staying within a distance from the person that enables uninterrupted, unaided visual and auditory communications.  On any land or waters controlled by the state, except at those locations where a sign has been posted permitting such operation.  While transporting any firearm, bow, or other implement for hunting, that is not unloaded and securely encased.  For the purpose of chasing, pursuing, capturing, or killing any wild animal or wild fowl. BAG LIMIT means the number, measurement, or weight of any kind of crayfish, aquatic insects, fish, frogs, turtles, wild birds, and wild quadrupeds permitted to be taken. BAITED AREA means any area where shelled or unshelled, shucked, or unshucked corn, wheat or other grain, salt, or other feed whatsoever capable of luring, attracting, or enticing game animals or birds is directly or indirectly placed, exposed, deposited, distributed, or scattered. Such area is considered a baited area for 10 days following complete removal of all such corn, wheat or other grain, salt, or other feed. BAITING means the placing, exposing, depositing, distributing, or scattering of shelled or unshelled corn, wheat or other grain, salt or other feed so as to constitute for wild turkeys, mourning doves, migratory birds, or other game animals a lure, attraction or enticement to, on or over any area where hunters are attempting to take them. 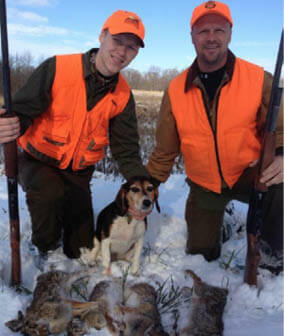 CLOSED SEASON means that period of time during which the taking of wild animals protected by Chapters 1531 and 1533 of the Ohio Revised Code is prohibited. CROSSBOW means a device for propelling an arrow by means of transverse limbs and a string, mounted on a stock at least 25 inches in length, and having a working safety. FURBEARING ANIMALS include minks, weasels, raccoons, skunks, opossums, muskrats, foxes, beavers, badgers, otters, coyotes, bobcats, and fishers. GAME BIRDS include ring-necked pheasants, bobwhite quail, ruffed grouse, sharp-tailed grouse, pinnated grouse, wild turkeys, Hungarian partridges, chukar partridges, woodcocks, crows, black-breasted plovers, golden plovers, Wilson’s snipe or jacksnipe, greater and lesser yellowlegs, rails, coots, gallinules, ducks, geese, mourning doves, Eurasian collared-doves, mergansers, and brant. GAME QUADRUPEDS include cottontail rabbits, chipmunks, flying squirrels, gray squirrels, black squirrels, fox squirrels, red squirrels, groundhogs, white-tailed deer, feral swine (wild boar), black bears, and porcupines. HUNTING means pursuing, shooting, killing, following after or on the trail of, lying in wait for, shooting at, or wounding wild birds or wild quadrupeds while employing any device commonly used to kill or wound wild birds or wild quadrupeds, whether such acts result in such killing or wounding or not. It includes every attempt to kill or wound and every act of assistance to any other person in killing or wounding or attempting to kill or wound wild birds or wild quadrupeds. LONGBOW or BOW means a device for propelling an arrow by means of limbs, and a string which is hand held, hand drawn, and held in a drawn position by hand or a hand-held mechanical release or by a mechanical device with a working safety. This would include compound bows and recurve bows. MIGRATORY GAME BIRDS are waterfowl, rails, mourning doves, and shorebirds. MUZZLELOADING SHOTGUN means a primitive weapon that is loaded exclusively from the muzzle and has a permanent breech plug. When the plug is removed the gun is rendered inoperable, or incapable of firing modern-day ammunition. NONGAME BIRDS include all other wild birds not included and defined as game birds. PLUGGED SHOTGUN means a shotgun capable of holding more than three shells that is plugged with a one-piece filler which limits the capacity of the gun to three shells. The filler must be such that it cannot be removed without disassembling the gun. PROTECTED SPECIES include yellowlegs, plovers, snowshoe hares, bears, badgers, bobcats, fishers, porcupines, flying squirrels, and nongame birds. Protected species may not be hunted or taken at any time. Hungarian partridge may not be taken except from a shooting preserve, dog training area, or field trial. TENANT means an individual who resides on land for which he or she pays rent and whose annual income is primarily derived from agricultural production conducted on that land, as agricultural production is defined in Section 929.01 of the Ohio Revised Code. TRAPPING means securing or attempting to secure possession of a wild bird or wild quadruped by means of setting, placing, drawing, or using any device that is designed to close upon, hold fast, confine, or otherwise capture a wild bird or wild quadruped whether such means result in such capturing or not. It includes every act of assistance to any other person in capturing wild birds or wild quadrupeds by means of such device whether such means result in such capturing or not. WILD ANIMALS include mollusks, crustaceans, aquatic insects, fish, reptiles, amphibians, wild birds, wild quadrupeds, and all other wild mammals. 2923.15 ORC No person, while under the influence of alcohol or any drug of abuse, shall carry or use any firearm or dangerous ordnance. 1. In a closed package, box, or case. 2. In a compartment which can be reached only by leaving the vehicle. 3. In plain sight and secured in a rack or holder made for the purpose. 4. If the firearm is at least 24 inches in overall length as measured from the muzzle to the part of the stock farthest from the muzzle, and if the barrel is at least 18 inches in length in plain sight with the action open or the firearm stripped, or, if the firearm is of a type which the action will not stay open or which cannot easily be stripped, in plain sight. A person possessing a valid Ohio-issued concealed handgun license may carry a concealed handgun in compliance with motor vehicle transportation guidelines of the Ohio Revised Code. As used in this section, unloaded means with respect to a firearm employing a percussion cap, flintlock, or other obsolete ignition system, that the firearm is uncapped, or that the priming charge is removed from the pan. The above sections also apply to watercraft, except while lawfully engaged in hunting.